I've been spending a lot of time on The Knot website lately trying to get ideas for the details of the wedding, and I have to say I've been inspired by a lot and in turn making a lot of little, personalized things for the wedding. But today, I was excited because someone from there sent me a message asking for my advice! She lives in Philadelphia and has the exact same dress as I do, and it's not one that is very common at all, and the color is unique so it presents some accessories 'challenges' that we're going to try to talk out. It will be nice to have someone with my same dress that I can bounce some ideas off of. On another note, we've got 4 suitcases, a garmet bag, a duffel bag and a large purse to take with us to Fargo on Wednesday. I've weighed these suitcases a dozen times, and they had better not weigh over 50 pounds at the airport because I do not want to pay the overage amount! It really is amazing the amount of stuff that we've acquired over the course of planning! Yesterday we were both dragging and I know that I was in bed by 9pm. I don't mind working hard, but I think 21 hours is a tad on the ridiculous side. It's nice to get overtime, but not when you're tired for 2 days afterwards. Oh well, the weekend is less than 3 hours away and we both need a break! Lots to do this weekend trying to prepare to go to Fargo next week. We have so much stuff to take back, it's a good thing that Northwest allows us to take 2 suitcases each, otherwise I don't know how much it would cost us to ship all of this stuff back. I just read an Associated Press article that stated “She has shown interest to come over to Namibia,” Jooste said by telephone from a conference in neighboring South Africa. “Nothing has been confirmed yet, but there is a definite possibility of that happening.” They are talking about Britney Spears. C'mon. Don't eat Angelina Jolie's leftovers and have the baby in Namibia. What are you going to do next, auction of the first photos for cash? Oh yeah, thats already been done. I feel bad for the girl, the entire world looks at her life and pokes fun, but she does do some stupid things that warrant that kind of attention. I am steadily trying to finish some wedding projects before Mike and I head back to North Dakota in two weeks to meet with vendors and bring along whatever wedding-related items we can. I have quite a list of projects that need to be done prior to leaving, or while we're in town. This weekend I made our ring-bearers pillow. I hated all of the traditional white pillows that are usually used. We aren't having a traditional wedding, Mike's aunt is going to be our 'ring bearer' and therefore, a traditional white pillow just wasn't going to cut it. Below is the end-product of Saturday's sewing project. 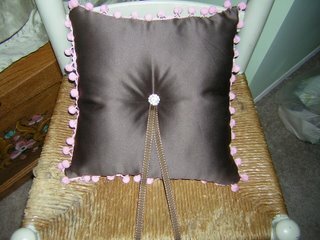 It's brown satin with pink pom-poms, brown and pink ribbon and a crystal button. I LOVE IT. I've been watching random videos on YouTube.com the last couple of days and I've never laughed harder. For some laughs I definitely recommend this one and this one. On the crap that people come up with when they're bored! But hey, I get bored and I have a video camera, maybe I'll get insired. It's absolutely beautiful today. Mike came downtown to take me to lunch and we walked to and from the restaurant in the perfect 80-degree weather. It wasn't hot or humid, just perfect, sunny, warm and fabulous! It made going back to work very, very difficult. Tonight we're headed about an hour north of us to see a Dave Matthews concert. I'm excited, not only because I love his concerts, but that the tickets were absolutely free! It's always nice to work for a company that has good perks. It was so nice to have Elaine in town last weekend! I warned her in advance that Ann Arbor didn't hold a whole lot as far as things to do and places to go, but I think we managed to get in the highlights. I had forgotten how awesome it was to shop with a girl (vs. Mike who hates shopping). And Elaine, we both know the highlight of your trip was driving to Dundee, MI to see the Cabela's superstore with the insane amount of taxidermied animals on display. 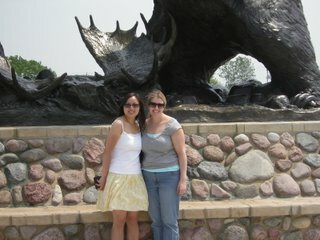 The picture below is use in front of a huge statue outside of a bear and a moose fighting. (you can see the antlers of the moose strewn across the bottom by the bears leg...nice...Michigan rules).